Welcome to the third issue of this Christmas special magazine. Your FREE gift this time is a gorgeous sentiment die – Believe in the magic of Christmas. It is such a lovely die, perfect to add as ‘just’ a sentiment, but equally it will stand on its own as the focus of your projects. Don’t forget to snip into it and use the ‘Believe, Magic or Christmas’ on their own. Take a look at the six projects designed especially for a little bit of inspiration. 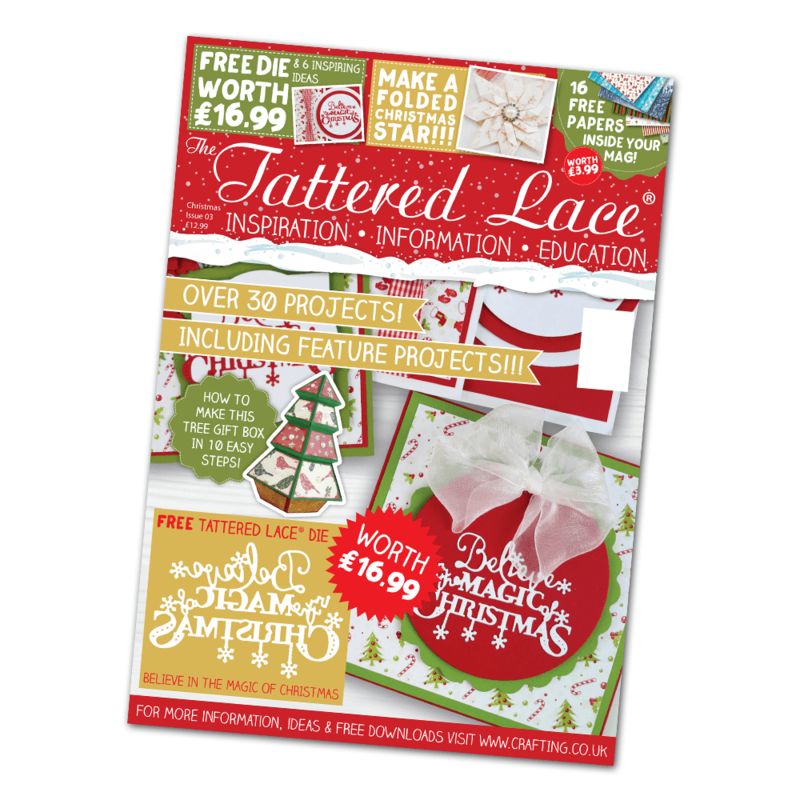 Apart from the FREE gift, there are lots of lovely festive dies featured in the magazine. There is contemporary, cute, girly, classic and a touch of elegance too. Craft a Snowflake Card, make a gorgeous Baroque Bauble or perhaps a Mega Poinsettia Bauble. Make a gift box laden with Holly Swirls and get chilly with some Snowman Hugs or Winter Walks. Look out for a Quilted Robin and a Santa that really is a Star! Don’t forget the dazzling free paper, prise open the staples in the centre and slip out those papers so you can get crafting straight away! There is a lovely template project to try, the Christmas Tree Gift Box. This is a gift box and a half! A bit of cutting, but so worth it! The folding project is a very simple folded star, great to make baubles or go big and make the star on the top of the tree. Great to do with the little ones during those rainy days that are sure to come.